The Texas Rangers won the AL West in a storybook season early Sunday evening before the Dallas Cowboys game at New Orleans ended like a grim fairytale. Far, far, far more D-FW viewers watched the Cowboys, of course. The Rangers drew a nice crowd that grew throughout the game. But it still wasn’t a big enough audience to outdraw Fox’s competing Green Bay Packers-San Francisco 49ers game. Cowboys-Saints, which ended in a 26-20 overtime loss for Dallas, averaged 1,593,540 viewers on NBC’s Sunday Night Football. That topped the still young season’s record of 1,527,306 viewers on Fox for the Game 2 Cowboys win over the Philadelphia Eagles. The Cowboys-Saints game had 746,290 viewers in the advertiser-prized 18-to-49-year-old demographic. That’s also a season-to-date record, easily surpassing the 690,682 viewers for Dallas’ season opener against the New York Giants on Sunday Night Football. 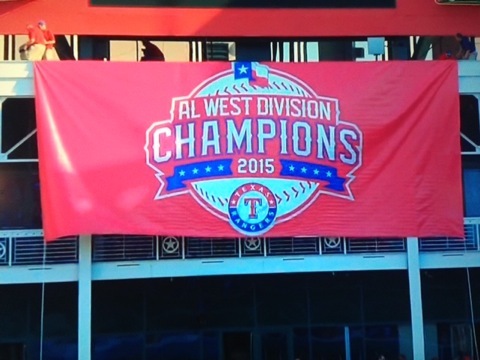 Earlier Sunday on Fox Sports Southwest, the Rangers clinched the Al West pennant at 5:02 p.m. when starter Cole Hamels threw the last pitch in a 9-2 win over the Los Angeles Angels. A total of 403,697 viewers gathered for the last pitch and the post-game celebration from 5 to 5:15 p.m. That also marked the peak audience for the game, which averaged 233,719 total viewers and 98,447 in the 18-to-49 age range. Over on Fox, the Packers-49ers game, which started at 3:25 p.m., averaged 467,438 total viewers and 235,002 in the 18-to-49 demographic. During the 5 to 5:15 p.m. segment when the Rangers won and celebrated, Packers-49ers drew 481,603 total viewers. And the game was mostly at halftime. CBS’ Jets-Dolphins game from London, which started at 8:30 a.m., averaged 162,895 total viewers. Among non-football attractions airing opposite all or part of the Cowboys game, CBS’ season premiere of Madam Secretary and the second episode of ABC’s Quantico tied for the most total viewers with 162,895 apiece. The Season 1 finale of AMC’s Fear the Walking Dead was the biggest draw among 18-to-49-year-olds with 123,852. On Saturday, ABC led the college football parade with a triple header that stretched from 11 a.m. to late night. TCU’s trashing of Texas had the biggest haul, with 212,472 total viewers. Baylor’s high-scoring win over Texas Tech, from Jerry’s Palace, followed with 191,225 viewers before Clemson’s close win over Notre Dame capped it off with 141,648 viewers. The Rangers-Angels game on Fox, which ended in horrifying fashion when Los Angeles scored 5 runs in the ninth to win 11-10, peaked at 347,038 viewers for the final carnage. Overall, the marathon game averaged 205,390 viewers. On to Friday night, where CBS’ 9 p.m. episode of Blue Bloods had the most total viewers with 233,719. The 7:30 p.m. premiere of ABC’s Dr. Ken had 113,318 viewers to run second in its time slot behind CBS’ closing half-hour of The Amazing Race (127,483 viewers). Dr. Ken dropped to third with 18-to-49-year-olds, losing to Fox’s competing repeat of The Grinder and The Amazing Race. CBS11 drew the most total viewers at 10 p.m. but TEGNA8 won among 25-to-54-year-olds (main advertiser target audience for news programming). Fox4 swept the 6 a.m. competitions and added wins at 5 and 6 p.m. among 25-to-54-year-olds. TEGNA8 ran first at 6 p.m. in total viewers and tied Fox4 for the top spot at 5 p.m.